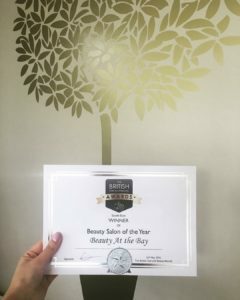 The Beauty Awards season is in full swing and Beauty at the Bay is in the running to pick up yet more awards. Whilst we are waiting to hear about how we fare in the forthcoming Newsquest North Essex Business Awards at Braxted Park on July 1st, where we have been nominated in two categories (more about that later), we have found out in the last 24 hours that we have won the British Hair and Beauty Awards Beauty Salon of the Year award which is fabulous news for all our staff and more importantly our wonderful clients. It may sound like a cliche but we really could not have won without our incredibly loyal and appreciative following. We LOVE you all!! If this news wasn’t amazing enough we have also been contacted by Scratch magazine who have informed us that we have made it through as finalists to their glitzy 2016 Scratch Stars Awards ceremony in both their Nail Salon of the Year (Salon Environment) AND Retail Salon of the Year categories. We had the best time with them last year and walked away with two winners trophies. Can history repeat itself? Winners will be announced on Sunday 5 June at a lavish party at London’s Cafe de Paris hosted by George Lamb. We’ll keep you posted. And we are not finished yet……… Today we received yet more good news, that we have made it through as finalists in the BABTAC & CIBTAC Awards whose prestigious ceremony takes place at The Hurlingham Club in London on the 12th June. 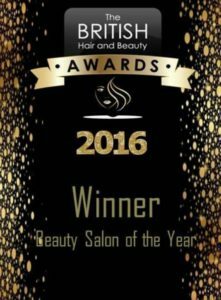 Again we are up for not one but two awards, namely Best Large Salon and Best Website. Obviously winning Best Large Salon would put us in dreamland but we are really excited about the possibility of winning the Best Website award as along with our marketing partner, Green Square Design, Print & Web we have put a lot of time, resource and energy into building a truly informative and interactive website with pretty much everything we could imagine being included within it. We want to win this one for Green Square! We thought 2015 was a good year but 2016 looks like being even better. Thank you once again for helping all our hard work pay off. The last few months have been very eventful and at the same time very exciting, with every new client being viewed as a possible secret shopper representing the various beauty awards organisations listed above. It’s a good job we make it our mission to treat even our most regular customers like every visit was their first. Keep reading our blogs and you’ll be amongst the first to know if we win in any of the categories that we are finalists in.